If you think that your kids have lots of time to grow up and learn about money, you might want to think again. According to researchers at the University of Cambridge commissioned by the UK’s Money Advice Service, kids’ money habits are formed by the time they turn 7. Whether it’s the family car or an upcoming vacation, it helps to share in detail how you built up your savings in order to make a big purchase. By doing so, your kids would have a glimpse at how saving works in the adult world and understand that if they really want something, they should save for it. Success stories can potentially inspire them, but don’t be afraid to share your failures too. When your kids discover what went wrong – perhaps when you were more careless with money – they can reflect and learn from your mistakes. Getting your kids to write their goals down is a great way to keep them accountable – simply because it’s tangible and easier to keep track. By creating a simple savings chart, your kids can visually monitor how much closer they are to hitting their target amount and as a result, be more likely to enjoy the process. Most people grow up with a piggybank or one savings jar. But that’s not enough to teach a person about budgeting. Instead of one jar, get three – complete with the labels “saving”, “spending” and “sharing”. 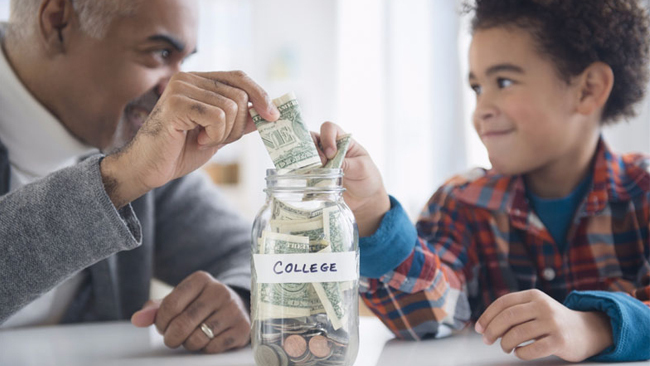 Every time your child receives money, whether from a birthday or special occasion, ensure that the money is divided equally among all three jars. In the event your child wants to make a small purchase, like snacks or stationary, he or she can use the money in the “spending” jar. The “sharing” jar’s money can be used to donate to a good cause or spent on a sibling’s gift. Bigger items that cost more would then be purchased with the money in the “saving” jar.